The three men convicted of plotting to bomb a Garden City apartment complex that housed Somali Muslims were sentenced Friday in federal court in Wichita. Curtis Allen, Patrick Stein and Gavin Wright were found guilty in April of conspiracy to use a weapon of mass destruction and conspiracy to violate the housing rights of their intended victims. Wright was also convicted of lying to the FBI. Federal Judge Eric Melgren sentenced each defendant separately over the course of the day-long hearing. Allen and Wright each received 25 years in prison for their role in their conspiracy; Wright will serve an additional year for lying to the FBI. Stein, who prosecutors argued was the leader behind the plot, received 30 years. All three defendants are in their 50s. Federal prosecutors had argued for life sentences for all three; they said it would be the only way to deter another crime driven by their ideology. McAllister said the government has preserved its right to potentially argue on appeal for longer sentences. Law enforcement arrested the men in October 2016 following a months-long investigation. Their trial in April of last year lasted two weeks and hinged largely on testimony from the FBI’s key informant, Dan Day. He recorded hundreds of hours of conversations and phone calls with the defendants over the course of several months. Prosecutors said the defendants had planned to bomb the apartment complex that housed more than 100 Somali Muslim immigrants the day after the 2016 presidential election. The complex also housed a mosque. But Melgren stressed that the men had been convicted of conspiracy, and whether the defendants could have carried it out was irrelevant. “Whether they did it, whether they could have done it, they intended to do it,” he said. Garden City residents hold a rally in front of the targeted apartment complex in 2016, days after three men were arrested for plotting to bomb it. The case exposed a network of militia groups in western Kansas, where immigrants and refugees — from Central America, Asia, Africa — have settled for decades, drawn to jobs in the numerous meatpacking plants there. Garden City is home to Tyson; in nearby Dodge City, there’s Cargill and National Beef. Allen, Stein and Wright formed their own fringe group, calling themselves “the Crusaders.” It’s then, prosecutors say, that the plot to attack the Somali immigrant community began to develop, driven by Stein. “The defendant started this conspiracy” after the deadly attack on the Pulse night club in Orlando, Florida, prosecutor Risa Berkower explained. That shooting was carried out by a man swearing allegiance to the Islamic State. 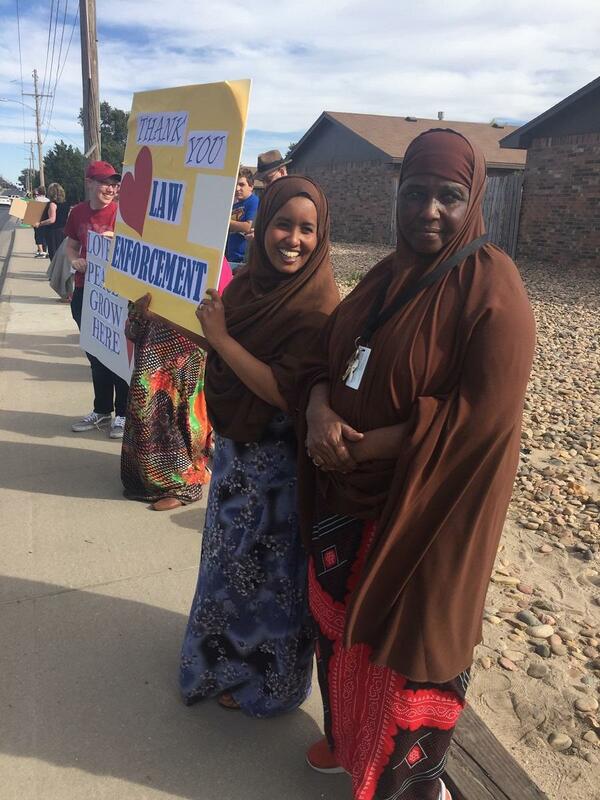 In videotaped statements played for the court Friday, members of the Somali community in Garden City recounted the fear they felt the day the men were arrested in 2016, and still feel today. One man says his wife has trouble sleeping. “We have a lot of people still scared,” he says. Utz, the police chief, gave his statement in person, explaining that he had driven the 200 miles to Wichita to let the court know how important the sentencing was to the community there. He noted that none of the three defendants lived in Garden City: Stein lived in Wright, Kansas; Allen and Wright both lived in Liberal. “They wanted to bring their hateful thoughts to Garden City,” Utz said. He urged Melgren to hand down the strictest sentences possible. Melgren declined to sentence all three men together, saying sentencing is “very personal,” and acknowledging that each of the three men had different roles in the conspiracy. He said he found the sentencing guidelines unhelpful. He noted the planned attack was “motivated by an animus” based on race, religion or national origin. Melgren showed some leniency toward Allen, who broke down while reading a written apology in court. “I’m ashamed of myself,” Allen said. Three men were found guilty Wednesday of conspiring to blow up an apartment complex in western Kansas that housed Somali immigrants. A key witness in the trial involving three Kansas men accused of planning an attack on Somali immigrants testified Thursday that the group was actively recruiting people to help carry out the alleged plot. Should Trump Rhetoric Be Considered In Kansas Bomb Plot Sentencing?